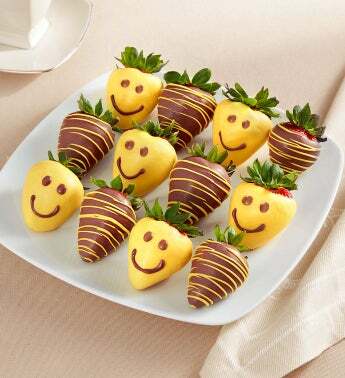 Brighten someone's day with these adorable dipped strawberries that are sure to inspire smiles. Six premium strawberries are dipped in a delicious chocolaty convection and finished with a yellow drizzle, while six berries are dipped in yellow confection and adorned with cheerful smiles. These berries ship overnight and arrive in a decorative Berrylicious gift box.